Want the price advantage of printing large quantities and the assurance that you have enough of whatever it is you want but do not have the storage space to handle it? In addition to being your printer, Fine Print Graphics can also be your warehouse. We have the ability to store items for you and deliver them when you need them! All you have to do is let us know what you require, and we can quickly get your order to you. Our warehouse is fully insured and climate controlled. Whether it was a hand delivery, a shipment via UPS or a trucking company, our shipping department can quickly track all packages. 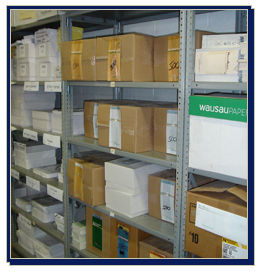 From our offices to our warehouse, we meet a variety of storage and distribution requirements for our customers.